For the past 25 years, Mike and his wife DeAnne have traveled to prisons all across the country sharing the love of Christ with thousands of inmates. Three years ago, their son Brandon also joined the ministry and now works with the youth in prison. Mike Barber Ministries' PRO-Claim TV hosts church services that are televised from inside prison on the Trinity Broadcasting Network (TBN) every Wednesday at 12:30pm EST. Click here to find your local listing. Pro-2011-20 from Pro-Claim on Vimeo. Special thanks to Mike and DeAnne for sharing this powerful teaching with our staff and residents. You definitely complimented the atmosphere at Mercy and had a huge impact on everyone! 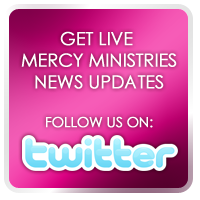 For more information about Mike and DeAnne and PRO-Claim ministries, go to http://pro-claim.tv/.